Health Care Renewal: Internal FDA memorandum of Feb. 23, 2010 to Jeffrey Shuren on HIT risks. Smoking gun? I report, you decide. Internal FDA memorandum of Feb. 23, 2010 to Jeffrey Shuren on HIT risks. Smoking gun? I report, you decide. From the aforementioned Huffington Post Investigative Fund article "FDA, Obama Digital Medical Records Team at Odds over Safety Oversight" and timeline of industry resistance to government oversight of health IT (link), one document stands out in my mind. The internal FDA memorandum of Feb. 23, 2010 ("not intended for public use") to Jeffrey Shuren on HIT risks. which I have now re-hosted at this link (PDF) is quite fascinating. Internal FDA Memo ("not intended for public use") on potential dangers of health IT. Download the full PDF by clicking here. 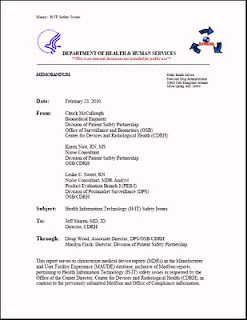 This report serves to characterize medical device reports (MDRs) in the Manufacturer and User Facility Experience (MAUDE) database, inclusive of MedSun reports, pertaining to Health Information Technology (H-IT) safety issues as requested by the Office of the Center Director, Center for Devices and Radiological Health (CDRH), in contrast to the previously submitted MedSun and Office of Compliance information. In summary, the results of this data review suggest significant clinical implications and public safety issues surrounding Health Information Technology. The most commonly reported H-IT safety issues included wrong patient/wrong data, medication administration issues, clinical data loss/miscalculation, and unforeseen software design issues; all of which have varying impact on the patient’s clinical care and outcome, which included 6 death and 43 injuries. The absence of mandatory reporting enforcement of H-IT safety issues limits the number of relevant MDRs and impedes a more comprehensive understanding of the actual problems and implications. ... (c) Correct identification by the reporter of the suspect device brand name is challenged by difficulties discerning the actual H-IT system versus the device it supports. 2. Due to incomplete information in the MDRs, it is difficult to unduplicate similar reports, potentially resulting in a higher number of reports than actual events. 3. Reported death and injury events may only be associated with the reported device but not necessarily attributed to the device. 4 Correct identification by the reporter of the manufacturer name is convoluted by the inability to discern the manufacturer of the actual H-IT system versus the device it supports. 5 The volume of MDR reporting to MAUDE may be impacted by a lack of understanding the reportability of H-IT safety issues and enforcement of such reporting. If HIT were VIOXX or Phen-Fen, the class action lawsuits would likely be starting already. One has to ask why this internal FDA report has not been made public until the Huffington Post article, nor been acted upon vigorously. The term of art is "double standard" compared to pharmaceuticals and other medical devices. The widespread use of electronic health records (EHRs) in the United States is inevitable. EHRs will improve caregivers’ decisions and patients’ outcomes. Once patients experience the benefits of this technology, they will demand nothing less from their providers. Hundreds of thousands of physicians have already seen these benefits in their clinical practice. ... a statement easily demonstrable to be without merit, in fact, then one has to wonder where science has gone. One also has to wonder if someone is short-circuiting the FDA's role in regulating this technology.Could Blumenthal (in essence a family doctor), Sibelius (a trial lawyer), DeParle, or others, or the White House itself be telling FDA how to conduct its business? Are they impeding FDA's regulatory role in the irrationally exuberant multi-billion $$$ race to HIT utopia? Finally, it is my belief that numerous health IT/medical informatics academics and talking heads who've steadfastly avoided the issue of health IT-related patient harm, or scoffed at it in legally-discoverable forums, might find themselves as defendants in upcoming plaintiff lawsuits. "Knew, or should have known" is the phrase that might apply. "I always get hives immediately after eating strawberries. But without a scientifically controlled experiment, it's not reliable data. So I continue to eat strawberries every day, since I can't tell if they cause hives." Are you implying that a family doctor left his patients to be a cheerleader for HIT and while doing so, depreciates the experts at the FDA and unilaterally declares HIT to be safe and efficacious? What the FDA approves nowadays ought to be taken with the whole salt shaker. It's already bad enough with drugs; I can't fathom where their expertise in HIT systems come from. In the meantime, just admire the peachy-dandy grade-AAA steaming pile of enzyme-free bovine fazoo posted by the ex-COO of a HIT vendor. One could swear HIT is as common and user-friendly as the microwave. Re: I can't fathom where their expertise in HIT systems come from. From longstanding regulation of pharma IT used in drug manufacturing, clinical trials data management, etc.